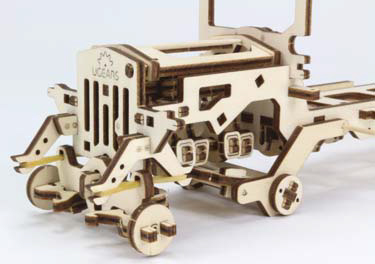 Ugears is a company based in Ukraine that produces various wooden mechanical model kits which are built without any glue or chemicals. 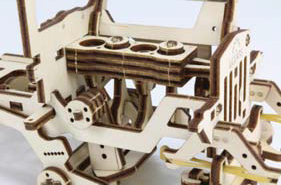 The designs are inspired by real life mechanisms with excellent levels of engineering and a quality production process. 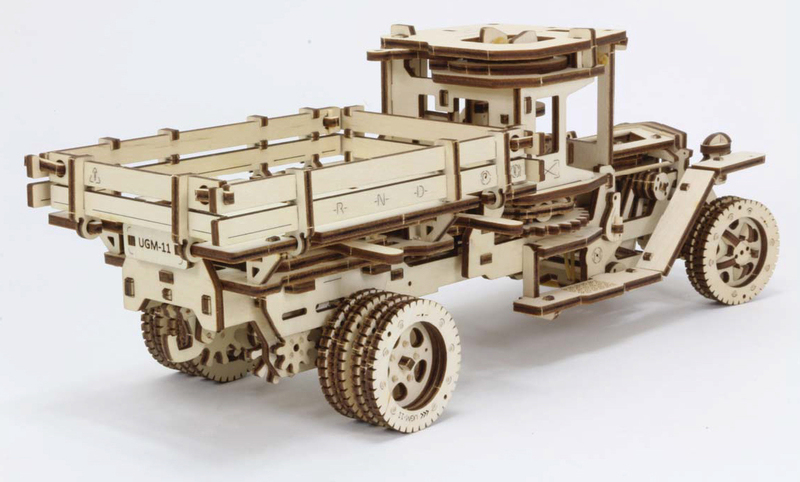 As a relatively new company, formed in 2014, they have already produced a number of ingenious products and the UGM-11 Truck is a rather special and unique model, consisting of 420 parts to give a finished model measuring 340mm x 140mm x 130mm. 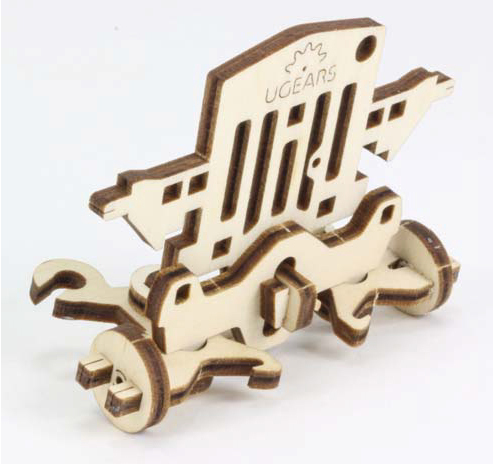 Each of the parts is laser cut from thin plywood sheets with a patented joint design making them easy to assemble while also keeping them sturdy. 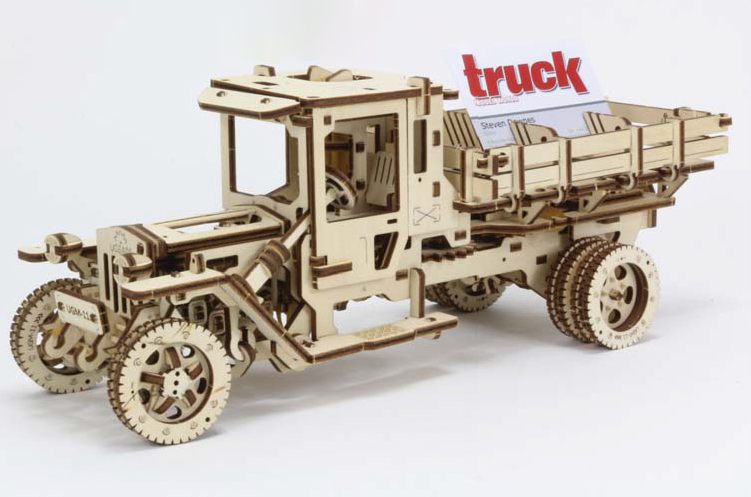 The features of the truck are quite sophisticated, with a rubber band motor at the heart of it providing the power to operate the gears to allow movement, not only of the vehicle, but also for the running pistons in the engine block and the rotation of the drive shaft with working steering and acceleration. 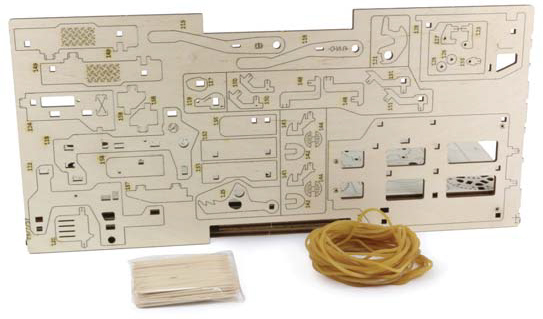 On opening the box, you are presented with a number of sheets of plywood with the various parts pre-cut so that they just need popping out. Initially, this is a little tricky as you don’t know how much force to use, but once the first couple of parts are removed, it becomes easy and no parts were broken by snapping them from the sheet. Incidentally, there is a sheet of additional parts which includes spares for a number of the more intricate and small parts so if one is damaged, there is likely a replacement. 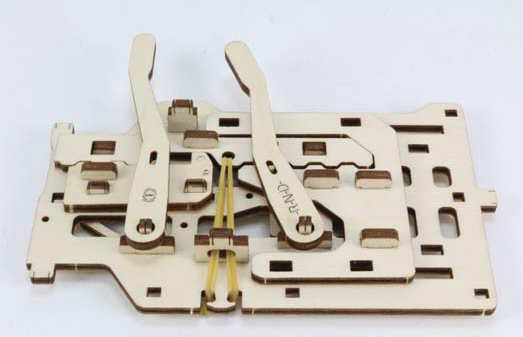 Also laser cut are some assembly aids which are used at different stages of the build for measuring or for adding the rubber bands into the rotation mechanism. 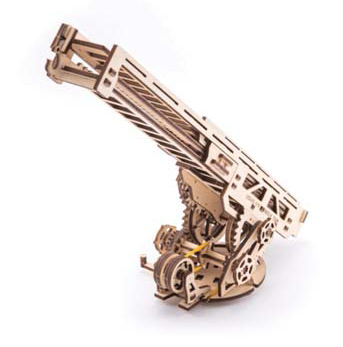 The parts are laser cut on six wooden sheets with cocktail sticks and elastic bands included. 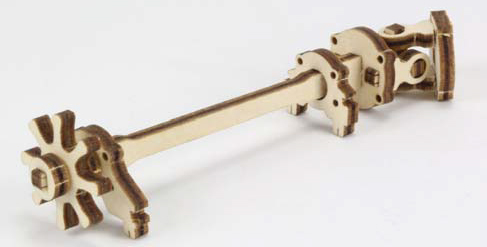 The main parts fit together with square or rectangular holes which the formed end of the parts push into. This does sometimes need a little force and it is recommended to use candle wax to make the parts slide together more easily. The ends of the parts have a clever design which grips once assembled and the model is very sturdy considering no glue is used. Cocktail sticks are includes and need cutting to different sizes in order to join some of the parts together and I found that a pair of side snips works very well. Here again, the fit is tight so some candle wax makes it a little easier to insert the sticks. The instructions are worth a mention, as the pages are presented in full colour with simple instructions all the way through. Towards the back of the instruction book are pictures of the pre built assemblies so you can check what you have built as you progress. The build starts with the main chassis parts and rear axle which has several cogs installed. Next up is the engine which consists of parts for a 4-cylinder engine block with cylinders that are cleverly connected to the main crankshaft. A universal joint is also built to transfer the power from the motor to the crankshaft and this works surprisingly well. The front axle has functional steering and slides along a slot in the front section to allow it to oscillate, simulating suspension and this goes together easily. The next stage is to install the engine block, drive-shaft and front radiator housing and hinged engine hood. The colour printed manual is split into a number of steps, each starting over on each page which is easy to follow. The steering linkage allows turning of the front axle by turning the steering wheel. Several parts are included which are used as assembly aids, so only a knife / side cutters are needed to assemble the parts. 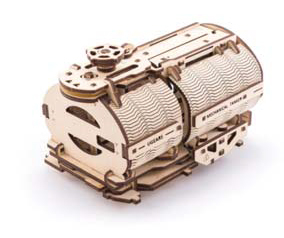 The heart of the model is the rubber band engine. The engineering of the parts is superb, like the universal joint on the drive shaft. The front axle is mounted to allow both rotation and sliding movement or realistic suspension. More sub assemblies for the engine bay include the engine cover and speed reducer. 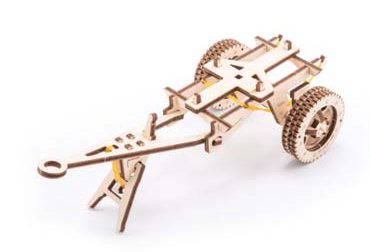 The heart of the model is the rubber band powered motor which is constructed with a toothed upper disc and a lower rotating mechanism which uses a number of small rollers to reduce friction and this again works very well. A ratchet is installed which stops the engine from unwinding and a number of rubber bands are then threaded through the housing, looped over the upper disc and back to the base. 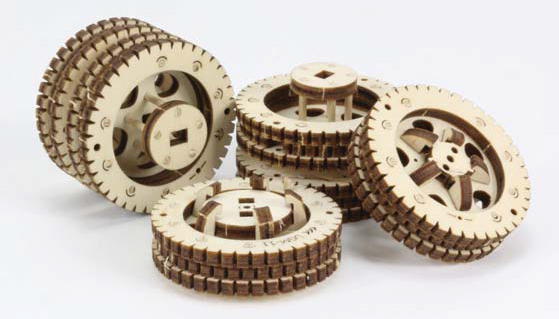 By rotating the upper disc, the tension of the rubber bands increases and once fully wound, it provides all the power for the truck’s movement. The completed wheels, ready for installation. For added grip, there is a recess along the centre of the wheel where a rubber band can be installed. Rubber bands are used to provide the tension on the front axle for realistic movement. 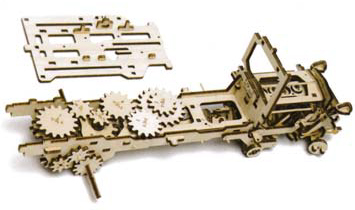 The underside of the chassis includes the drive shaft to the cog near the rear axle. 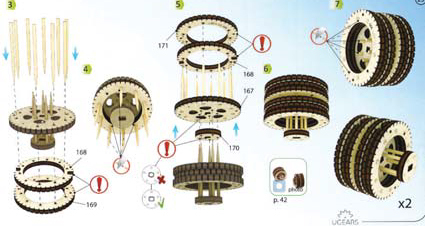 Images at the back of the manual show the correct alignment of the gearing. The model is coming together with the motor, engine and chassis completed. A number of cogs are installed on the top of the chassis to transfer the motor’s power to the rear axle. The wheels are cleverly constructed, using the cocktail sticks to join the sections together. The model is coming together, with the engine block, hood and speed restrictor fitted. Once this is installed on the chassis, a number of toothed gears and cogs are installed to transfer the power to the rear of the model where it meets with the toothed wheel fitted to the driveshaft. A plate is installed above this to keep all the gears in place and on top of this are two selector levers which operate to select the movement and to switch between forward, neutral and reverse. This is achieved in a clever way with a floating cog installed on each side of the chassis. By sliding the lever, the cog on the left side makes contact with the rear axle, producing reverse movement while sliding the lever the opposite way raises the left cog and lowers the right cog, providing forward movement. Rear view of the completed model once the tow hook and rear number plate have been installed. 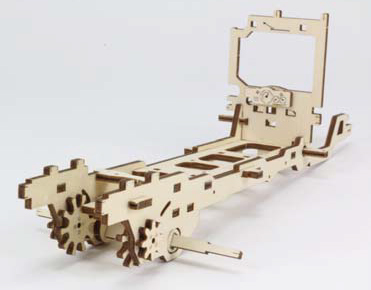 The operation of the forward and reverse gearing is cleverly implemented, using sliding plates to engage and disengage the gears to the drive axle. Two levers are installed with a clever sliding selection mechanism to turn on the power to the axle while also selecting between forward, neutral or reverse. Both sides and the rear panels of the cargo area can be folded down with small levers keeping them locked in the raised position. The driver cab has a hinged door and an accelerator pedal which affects the running of the engine to speed it up while the steering wheel is linked to the front axle to provide the steering motion. The rear of the model is finished with a cargo area which has hinged side and rear panels which unlock and lower for easier loading. Included in the kit is a business card holder which makes a good load for the cargo bay. 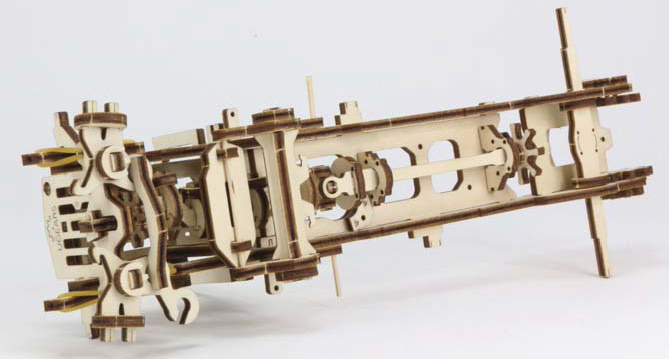 I thoroughly enjoyed building this mechanical model and it is certainly something different than building plastic model kits and also more interesting than a jigsaw puzzle. 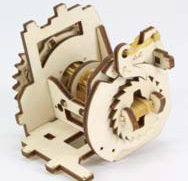 To check out all the different wooden mechanical models available, visit the Ugears website (www.ugearsmodels.com) and for those in the UK, it can be purchased from Hobby’s online store (www.hobby.uk.com). 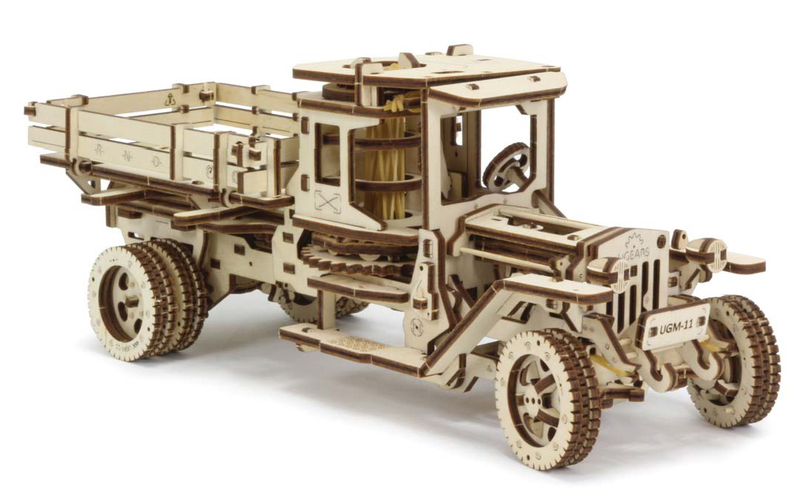 There is an accessory kit available which contains two different options to transform the truck into something different, including a tanker which actually holds a standard 330ml drinks can or a fire engine with extending and rotating ladder. 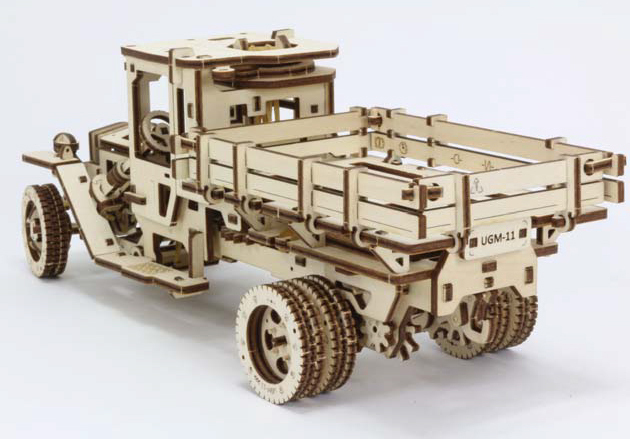 The set also includes a towed trailer which can be connected to the rear hook of the truck. The cabin has an opening door with a seat and accelerator pedal fitted. The kit even comes with a business card holder as a load. Another body is an extending ladder with 360 degree rotation. Additional bodies are available to fit on the truck chassis, like this tanker which opens to allow a standard coke can to be inserted, a rather nice can holder. There is also a trailer frame with cargo body that can be hooked up to the truck.